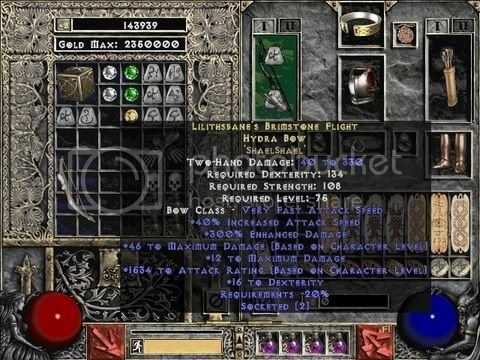 Discussion in 'Diablo 2 Community Forum' started by windwingwind, Sep 16, 2006. I am looking for some goddly rare bows so I pick up every yellow bow when I MF. So a yellow short war bow dropped and I promptly brought it back to town to ID it. Couldn't help falling on the ground when I see this. How's the crappiest rare you ever seen? Screenies would be nice :cloud9:. they all can't look like this bow. That's why the bow is named pain. Too lazy to take a s/s, but I have rare gloves with +1 light radius. owned..
Meh. Throw it on a merc. Ethereal Dagger: Adds 1-2 Damage... that's it. If you really want a screenshot, I'll start looking for it as I'm beginning to reset my non-ladder accounts. Don't even get me started on my SLvl1 Blizzard Snowclash... Thanks, Blizzard, you bums. Wow, that's a CHUNKY bow SD, if only it was a +3 GMB or something. Can't win 'em all, I guess. I had a pair of rare leather gloves with one mod : +1 to light radius. It was my prized possesion, but it expired. you don't need need skills if you are making a strafer...that bow kills almost as fast as a wf...that is a hard thing to do for any bow in the game except for a couple runewords. wow superdave, thats one godly rare.